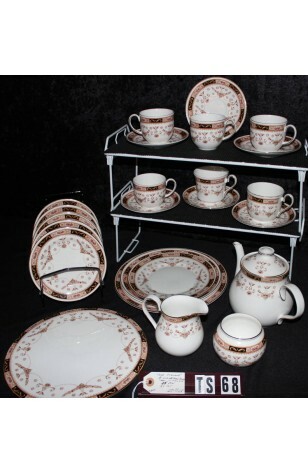 Vintage - Elizabethan Fine Bone China, "Olde England" Classic Pattern, Hand Decorated, 25-Piece, Tea Set, Circa 1930's. A truly gorgeous Elizabethan China Tea Set Service for (6) in the "Olde England" Classic Pattern. Colors include, Black, Brown, 22kt Gold, Red, Yellow and Green. Rim has Black insets w/22kt Gold Feathers, Flower insets in Yellow & Red, Swags & Hanging Baskets in Brown on Inner portion of Plates, and Outer Edges of Cups, Sugar Bowl, Creamer and Tea Pot. These Pieces are Beautiful, Old, and in Great Condition. Missing one Tea Plate. However, look at all that is included... Wow..
A truly gorgeous Elizabethan China Tea Set Service for (6) in the "Olde England" Classic Pattern. Colors include, Black, Brown, 22kt Gold, Red, Yellow and Green. Rim has Black insets w/22kt Gold Feathers, Flower insets in Yellow & Red, Swags & Hanging Baskets in Brown on Inner portion of Plates, and Outer Edges of Cups, Sugar Bowl, Creamer and Tea Pot. These Pieces are Beautiful, Old, and in Great Condition. Missing one Tea Plate. However, look at all that is included... Wow. Great Resale Condition unless noted below or in pictures. 6 - Saucers - 5 5/8"